Helmet bascinet has appeared in the XIV century and was probably even more popular than Chapel-de-fer in the Western Europe and England. 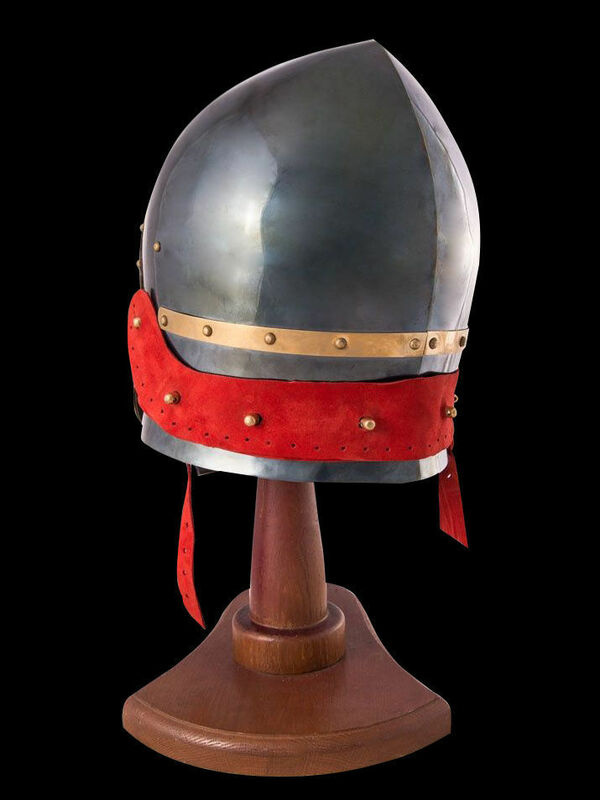 Metal cap cervelliere – early and simple version of basinet - was as worn under the Great Helm, so used separately. 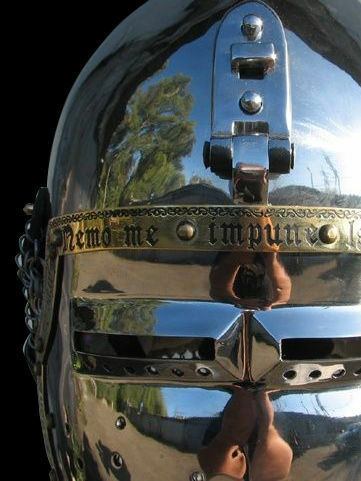 Both, noble knights and usual infantry used such type of medieval battle helmet. This model of hand-made German bascinet with klappvisor is typical for 1330-1340 years. Klappvisor is a type of visor’s attaching with hinge to the dome. Such attaching allowed a knight to remove a visor and attach nasal plate. Holes and oculars on visor allow great visibility and breathing. This functional helmet is fixed with underchin belt.  By your wish, we may install vervelles and leather strip for attaching of mail aventail, with which your neck and shoulders will be additionally protected. 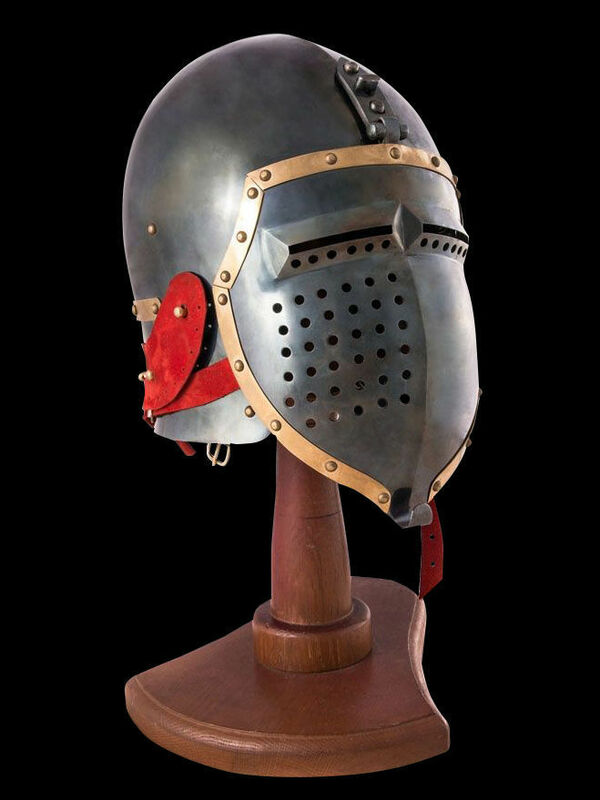 You may also like these models of medieval head protection with klappvisor: Bascinet helmet from Higgins Museum, Bascinet Hounskull of the XV century, onion-top bascinet with klappvisor. 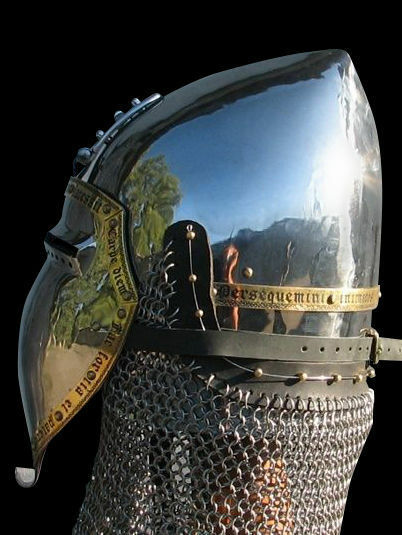 Bascinets was one of the most demanded and popular type of medieval battle helm all over Europe starting the XIV century. 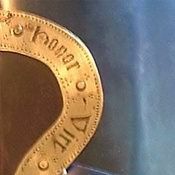 These functional head protection was in use by rich knights and common soldiers. 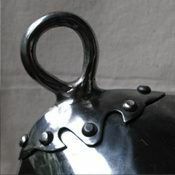 Quite often, bascinets had different design depending on the region. Mail aventail was protecting neck and shoulders of warrior. 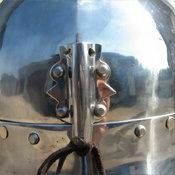 This battle steel helm has a dome, typical for medieval basinet and supplied with bar grill visor. Distance between rods is 1.8-2.0 mm that is totally compliant to SCA-standards. Visor is attached to the top of helmet with hinge. You can use this functional battle bascinet for: SCA HEMA Larp Stage performances Medieval festivals Reenactment events Main photo shows custom medieval helm with following options: Cold-rolled steel 1.5 mm; Mirror polishing as finish treatment; Brown leather belt; Steel rivets; Steel nickel-plated buckles; Sewn liner; Attaching of visor with hinge; Steel vervelles for aventail Base price includes following options: ..
Onion top bascinet with klappvisor is a type of medieval battle helm, which appeared in the XIV century. This head protection got its name because of dome shape, which looks like an onion. This German style steel helmet has a klappvisor – type of visor attaching with hinge to the dome. Such visor is removable and may be replaced with bar grill. Eye slits and holes provide with good vision and free breathing. Helmet is fixed with underchin belt; sewn liner make wearing very comfortable. We recommend completing battle helm with mail aventail for protection of your neck and shoulders. You can use this functional battle bascinet for: SCA HEMA Larp Stage performances Medieval festivals Reenactment events Main photo shows custom medieval helm with following options: Cold-rolled steel 1.5 mm; Mirror polishing as finish treatment; Brown leather belt; Steel rivets; Steel nickel-plated buckles; Sewn liner; Attaching of visor with hinge; Steel vervelles for aventail Base price inclu..
Bascinet Hounskull (German “Hundsgugel”) is a type of popular medieval helmet that was in wide use among European knights of all military branches in the XIV-XV centuries. Helm basinet itself could have various shapes of dome and design of visor. However, visor “Hounskull” was still the most demanded. Its shape not only provided with great vision and breathing, but also reflected direct nobs. 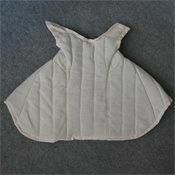 Bascinets were usually completed with scale, mail aventails or/and padded pelerines. Thus, way, neck, shoulders and upper parts of chest were protected well. Our custom-made bascinet Hounskull has sewn liner, so your medieval head protection will be very comfortable in wearing. You can use this battle helmet for: SCA HEMA Larp Stage performances Medieval festivals Reenactment events Main photo shows functional helmet with following options: Cold-rolled steel 1.5 mm; Satin polishing as finish treatment; Brass rivets; Brass vervelles for aventail; Brass buckles; Red leather belts; Attaching system for..
Leather padded medieval coif There is posh, cool and classy big brother of modest Padded medieval coif. It is as thick, soft, resilient and reliable as its plain linen relative, but it is a tough guy! This coif is perfect as for light trainings with bokkens, so being hidden under the helmet in steel tournament chopper. A knight, wearing it, looks at glance at others with light superiority and it has reasons – who else could impress with such classy and stylish protection. Generally speaking, VIP coif is for VIPs. Lining and wadding are made of the softest cotton; stitching is made with hardest threads. Color of leather may be various, just by your wishes. 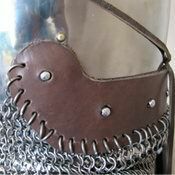 Think about chic protection of your head, neck and collarbones and order handcrafted leather padded medieval coif. .. This model of Tophelm – Helmet with horns – is typical for European cavalryman of XIII-XIV centuries. We made horns as top figure of the helmet. Such types of medieval helmet was worn over the mail coif, under what liner with stuffed roller was used. Late topfhelm was often worn over close-fitting skullcap cervelliere that in time evolved in bascinet. Then mail coif was replaced with aventail, that was attached to the under helm (cervelliere or bascinet). Steel armor of such type was often used as a part of full European knight armor. You can use this medieval knight helmet for: SCA HEMA Larp Stage performances Medieval festivals Reenactment events Base price includes following options: Cold-rolled steel 1.5 mm; Satin polishing; Brown leather belts; Steel nickel-plated buckles; Steel rivets; Decorative horns Main photo shows functional steel helmet with following options: Cold-rolled steel 1.5 mm; Satin polishing as finish treatment; Brown leather be..
Bascinet must be the most popular type of medieval closed helmets. Only chapel could compete in popularity with it; though, wearers of these helmets were quite different. Shape of bascinet helmet notably varied not only in different historical period, but also depending on the area of wearer’s living. But, in our humble opinion, spherical conical shape of dome with a center, shifted to the back – this one was the most widespread on the territory of the West Europe. “Roman d'Alexandre”, dated by the XII century with paintings of the XIV century is inexhaustible source in this issue. So, our stylization of medieval bascinet was based on the paintings from this collection of legends. Basinet painting, Fresco at Rocca Albornoziana, Orvieto, Italy Image of bascinet from “Roman D’Alexandre” As for the bascinet visor, so we could not decide which one to make, when choosing among great variety. Each of them is the best by itself, but we had to choose an ideal one for a battle, with good protective qualities, perfec..